The Declaration was drafted by some 180 experts from 85 countries at Global Congress on Intellectual Property and the Public Interest, held at the American University Washington College of Law in Washington, DC on August 25-27, 2011. As the only scholar from China, Prof. Xue attended the Congress and presented at several workshops. She particularly warned the danger of over-expansive of private ordering in IP enforcement. The Declaration offers a range of recommended actions, aimed at issues such as limitations and exceptions to copyright, reining in IP enforcement, promotion of open access, and implementing development agendas. The declaration has a number of sections, entitled: Putting intellectual property in its place, valuing openness and the public domain, strengthening limitations and exceptions, setting public interest priorities for patent reform, supporting cultural creativity, and requiring evidence-based policy making. * requiring evidence, “rather than faith or ideology,” to be the core of all policy-making. The Declaration intends to chart a more positive agenda – “one where the regulatory systems governing information and its products is informed by a fuller range of fundamental values and consideration of the public interest,” as stated by the Organization of WCL. 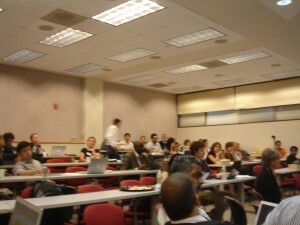 Global Academy on A2K held the post-Congress meeting in Washington on August 28, 2011. Representatives from Yale, China, Brazil, Egypt and South Africa participated the discussion. Many others, from India or France presented as well. Prof. Xue is leading the Chinese country study project on A2K. Her team is planning to complete the output by the end of 2011. On 5 August 2011, the Nominating Committee announced its selections for eight leadership positions within ICANN.Prof. Hong Xue is the only appointed Council Member of ccNSO. The Appointees will take up their positions after the end of ICANN’s Annual General Meeting in Dakar, Senegal, on 28 October 2011. The NomCom’s Chair, Adam Peake, said “We are very pleased to have been able to select such high quality people to join ICANN. They are a great group, bringing skills and experience that will serve the community well. It’s been a tough job, the NomCom had to choose from a very strong applicant pool, with many highly qualified candidates for every position, including a record number of female applicants. After many hours of teleconferences and meetings, and then almost two and half days of discussion locked away in a room in Singapore, we reached unanimous agreement on all the selected nominees and the overall slate that includes individuals from China, Germany, Jamaica, Malaysia, Nigeria, Philippines and United States. Thanks to my committee for their hard work, and on behalf of all the NomCom a very sincere Thank You to all 88 candidates who gave their time and effort in volunteering to help ICANN”. The NomCom evaluated over eighty-eight candidates, many of whom with exceptional qualifications in relation to the key criteria as set out in the ICANN Bylaws. With such a rich pool of candidates and very few seats to fill, the NomCom found itself unable to appoint all the applicants the Committee members would have desired to see on the Board and on the other bodies.